It’s been a couple of weeks since the last post and we should soon have the seismic retrofit design completed. In the meantime, we’ve not been idle. 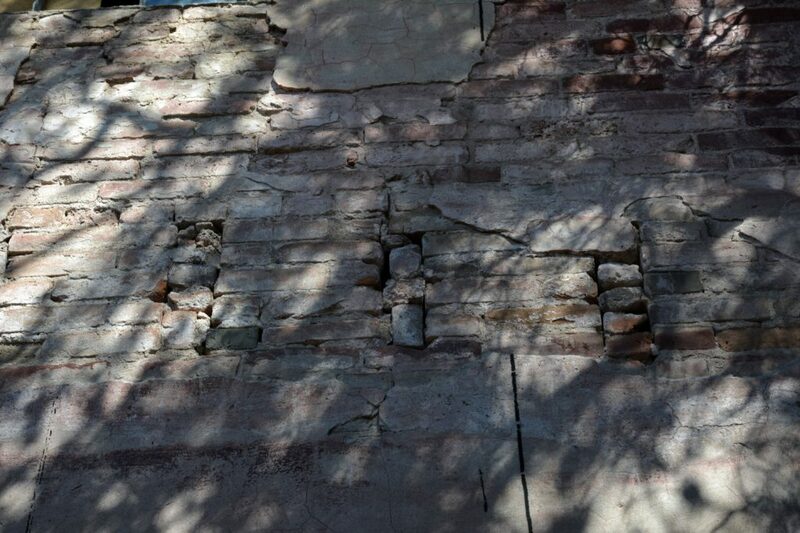 We’ve started a Gofundme page to help with the seismic retrofits since this is the largest line item in the budget and it benefits the historic community. We’ve also continued to clear out the lath and plaster from the second floor and expect to have that done in a week or two. But that’s all the tedious stuff and we’ve had to have at least a little fun to keep ourselves entertained. Based on recommendations from the Historic Commission, I’ve come up with a color scheme that may work. The red is brick, of course, and the gold and green are historically correct for Victorian trim and wall colors. You may also note that the column bases on the balcony have become rather large. This is based on the engineer’s requirement that the concrete column footings must be 14″ square and rise 5″ above the sidewalk. This Could be a trip hazard so I’ll fashion paneled wood boxes to turn the footings into architectural elements that at least look period. I’ll have to run this by the Historic Commission but it should be okay since the large footings are a structural safety issue which overrides historic correctness in many cases. To all my lovely readers, I’m in need of your wisdom. As you’ve probably noticed from previous photos, most of the windows in the Union are pretty much toast. The jambs can possibly be saved but the double hung sashes are crispy critter. I’ve been looking at several all wood six over six lite windows but no matter what brand, they all have bad reviews including fogging, leaking frames and even exploding glass. Have any of you had good experience with a window manufacturer? I’d love to have your input. Author DustyPosted on September 14, 2016 6 Comments on Argh! Windows! 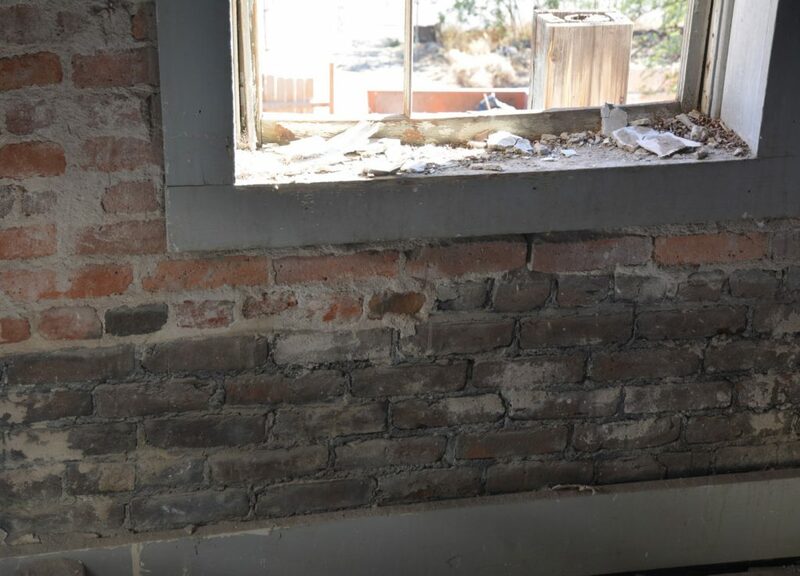 As we peel back the layers of old plaster and past remodels, it’s becoming apparent that the Union Hotel was not built all at once and possibly did not even start out as a hotel in the first place. 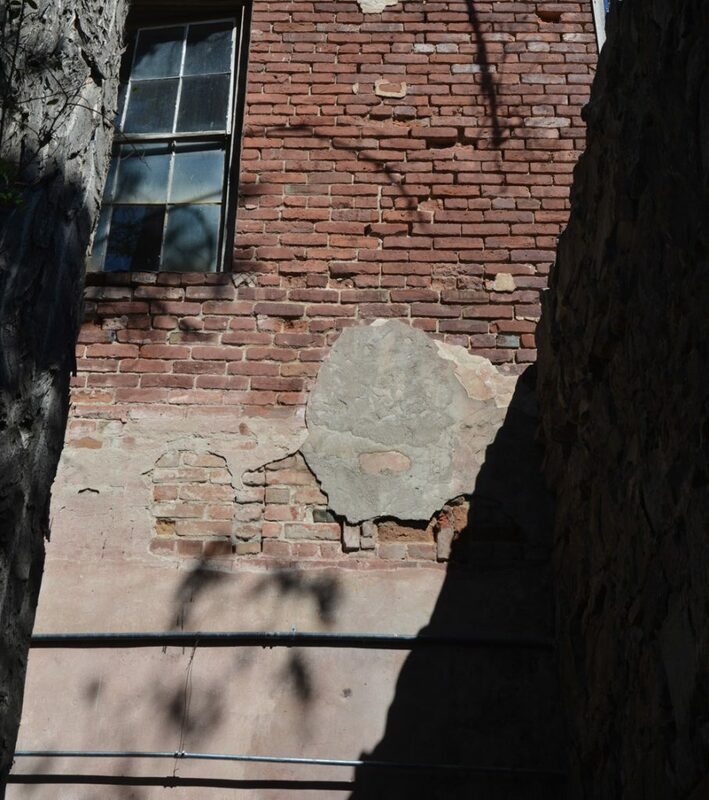 Currently, it’s agreed that the stone wall of the court yard is the old Pony Express building that predated the hotel structure by many years but the evidence is tossing up some contradictions. 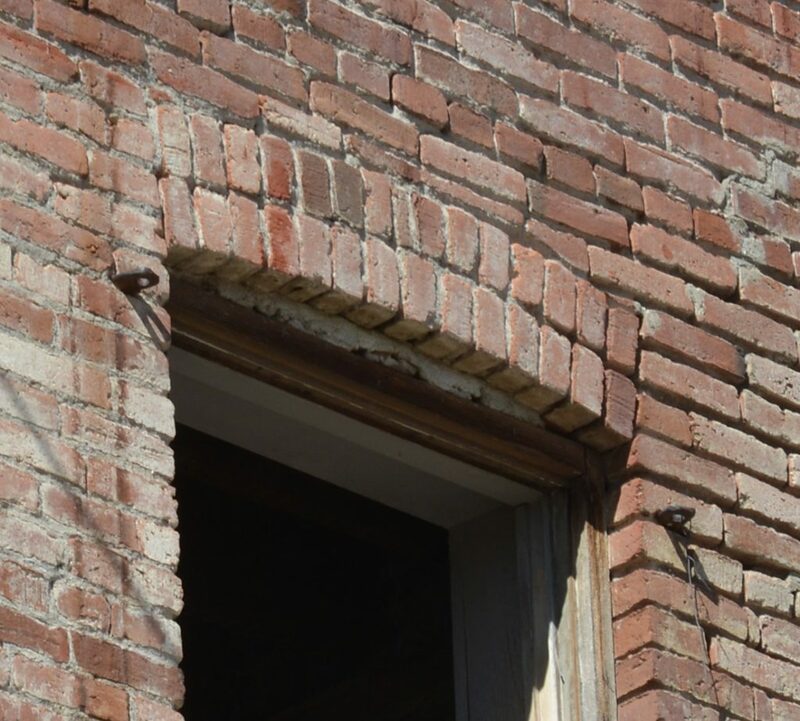 From the following photos, it looks like the roof structure of the Pony Express building actually used the side of the hotel as a support which is impossible if the hotel was not built at the same time or before the Pony Express building. 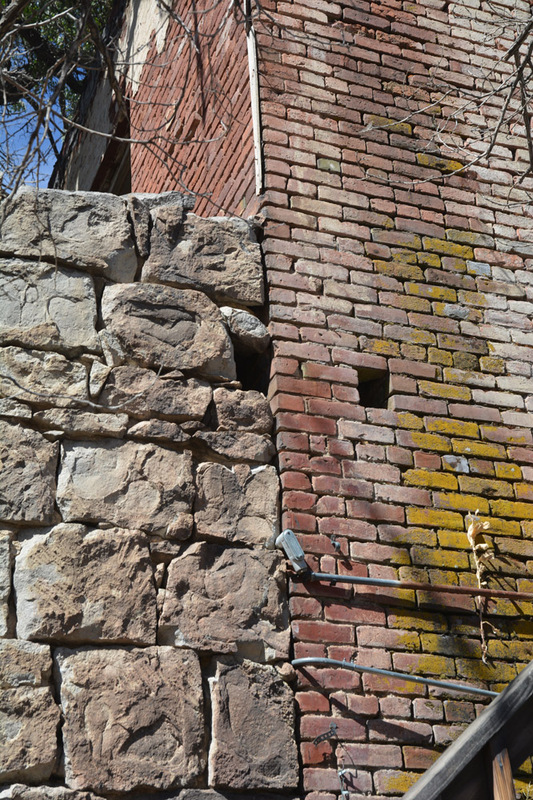 The beam pockets in the pony express wall align with the beam pockets in the brick wall of the hotel. Also, it seems apparent that the rear wall of the Pony Express building was neatly tailored to the hotel wall. This suggests that the Pony Express building was built after the hotel structure which messes with the accepted later construction date of the hotel. 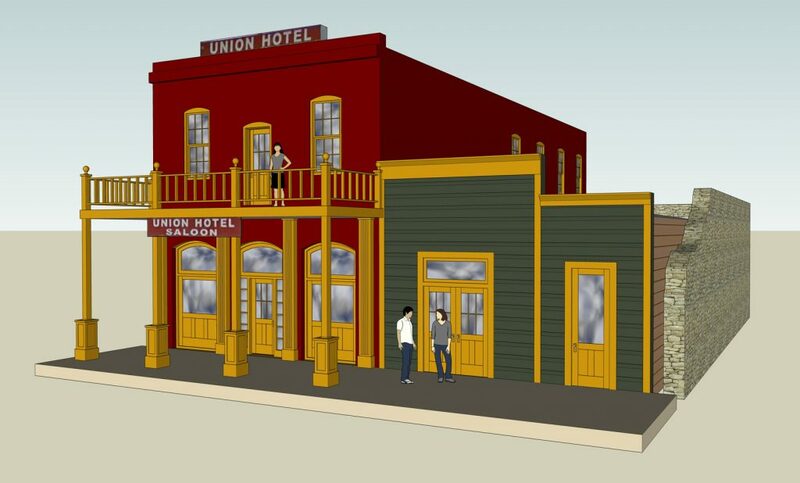 Considering this, I’m contemplating the idea that there was a brick structure on the hotel site that was as old or older than the Pony Express building and that that structure was later converted into the Union Hotel on the date that is historically agreed upon. My first bit of evidence is the window headers on the first and second floors. They are not the same. On the first floor, the windows are deep set. The masonry is supported by multiple iron bars and a fancy flat keystone of vertically arranged bricks. On the second floor, the windows are not as deeply set. 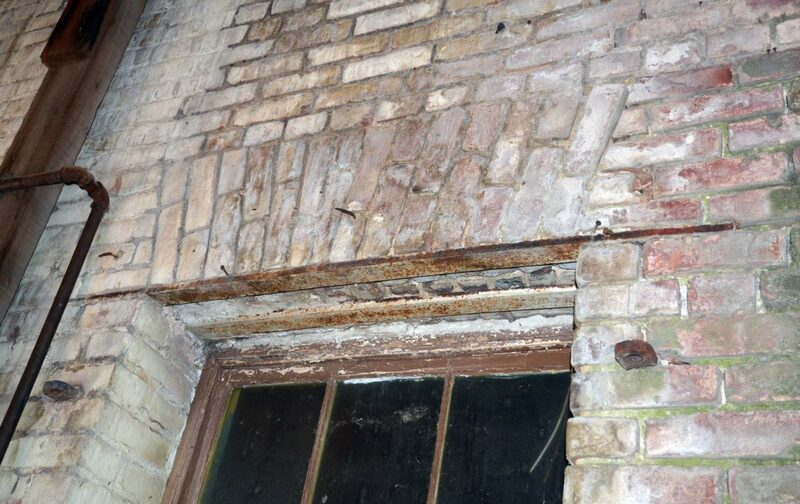 Only a single iron bar is visible and the keystone is an arch of horizontally laid brick. There is also a subtle change in brick color between the first and second floors. If you look closely, you can see that the bricks between the beam pockets are a lighter shade than those above the beam pockets. 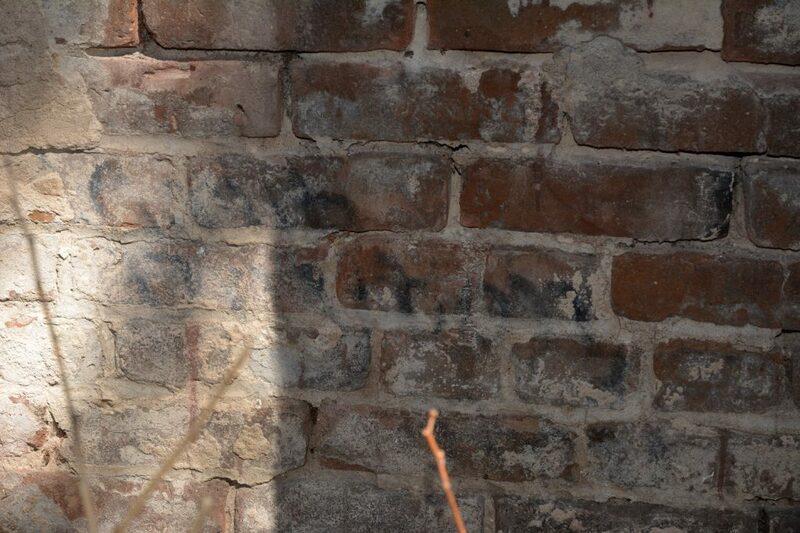 This can mean either that they are a different brick or possibly weathering has changed the color. The detail is inconclusive so let’s look at some other pictures. Inside the second floor bedrooms at the rear of the building is another clue. 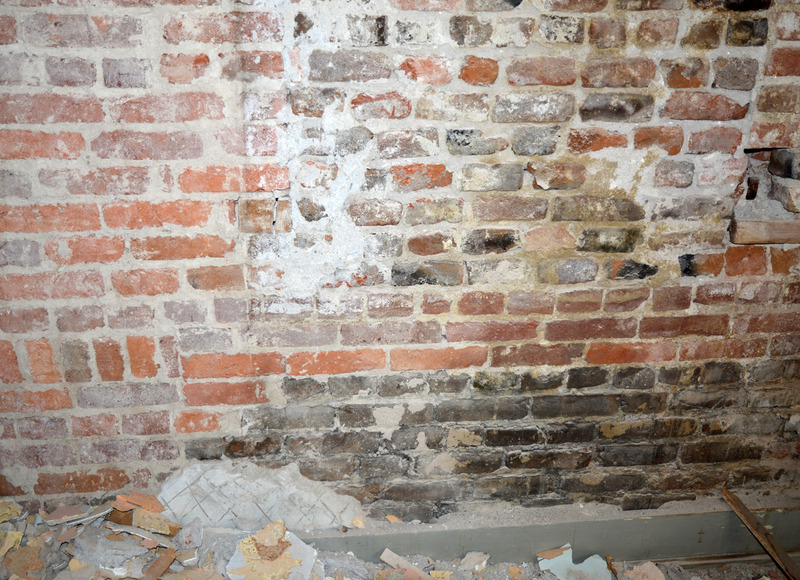 Note the burn marks on the mortar and bricks at the base of the wall and how they stop after the sixth course of bricks. This tells me that the first floor structure burned and that when it was rebuilt, a second floor was added. That would explain the difference in window style between the first and second floors. It could also support the theory that there was an older structure on site that became the Union Hotel in later years. If that’s the case, then what was the earlier building? Perhaps there is an explanation. This message is written in carbide lamp soot and it’s been hiding under the plaster in the Pony Express yard for a very long time. I can’t read it. Does anyone have sharper eyes than me? I heard in a movie once that when the Romans didn’t know what to do next, they built stuff. In the case of the movie, they were referring to things like catapults and scaling towers but the theory still holds true in more peaceful endeavors. In my case, the bid for cleaning out the second floor lath and plaster turned out to be way more than I wanted to pay so it behooved me to come up with a another solution. Renting a dumpster was the easy part but actually getting the construction debris to it from the second floor was a bit of a trick. The hotel’s rear balcony was a perfect exit but the decrepit old carport stood between it and the best place to park the dumpster. Then, I think of our friends the Romans and it hits me that I just need to build a solution. 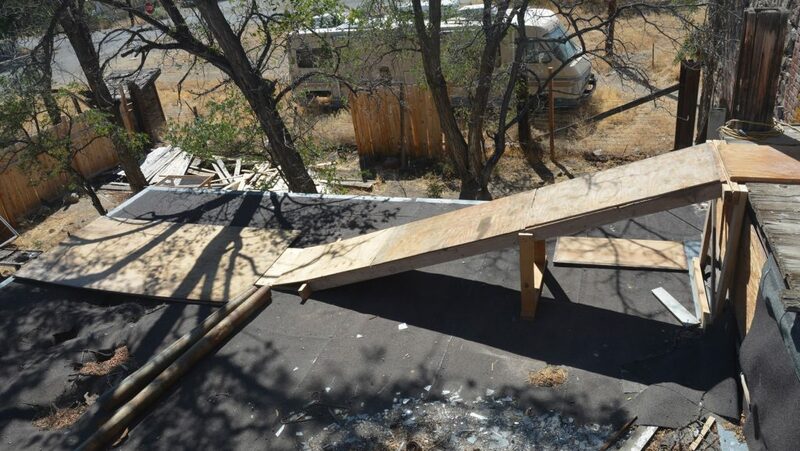 Using salvaged lumber, I created a ramp from the balcony down to the roof of the carport. The sheathing on the carport was way to0 rotted to safely walk on so I located my supports over the carport rafters hiding underneath the sheathing. Now, I can just roll a wheelbarrow down the ramp and dump it in the dumpster from the top of the carport. On another topic, we had a visitor last Friday night. It’s apparent that someone came up the stairs to the back balcony and broke in through the second floor door. This was a feat in itself because those stairs were so scary that I would not have attempted them myself. But I digress. Nothing was taken but whomever got in went on to break the only complete unbroken window in the building. 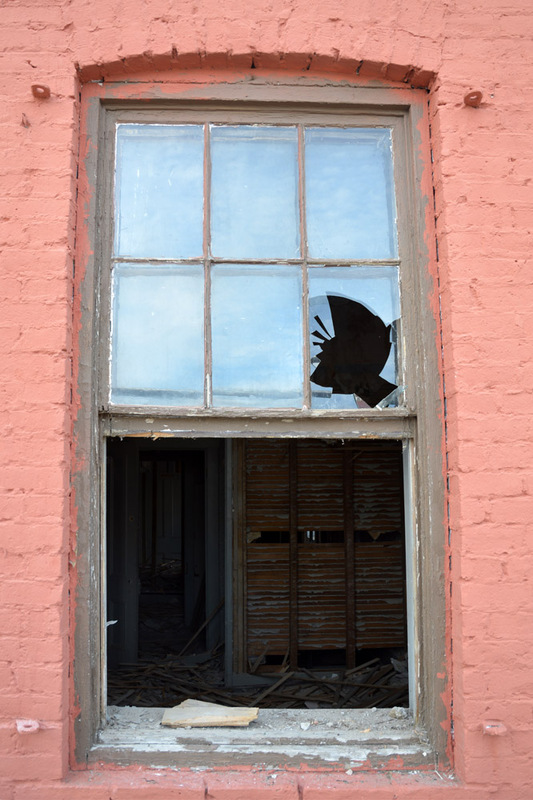 They lifted the lower sash and then broke the glass in both the upper and lower sashes with one strike from the inside. 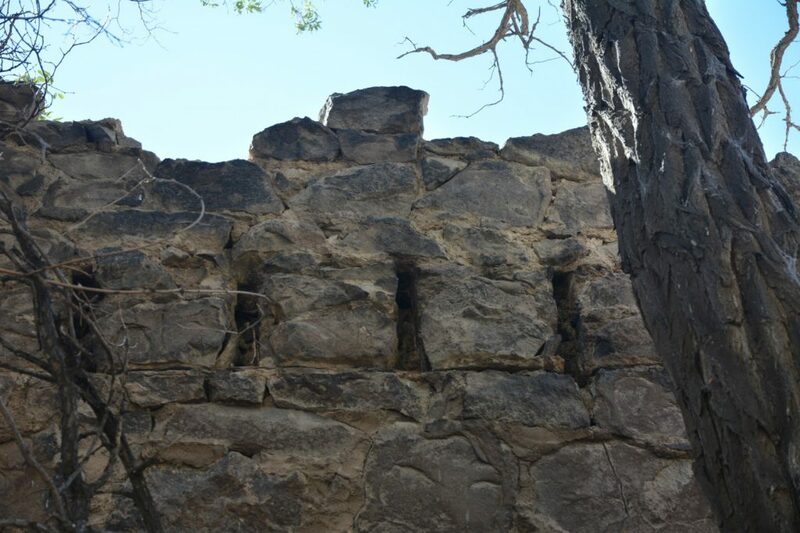 I hope that they realize that this is a protected historic structure and that vandalizing it is a felony and not a misdemeanor.